It’s always gratifying to see one’s own design ideas carried into new designs. In my dreams I always hope that something I have made might trigger a new idea in someone else and that they will somehow take my original design forward. I love the buzz I get from creating something that I perceive as beautiful and would love to think that someone else gets inspired from seeing something I have made so that they get that buzz of enjoyment too. 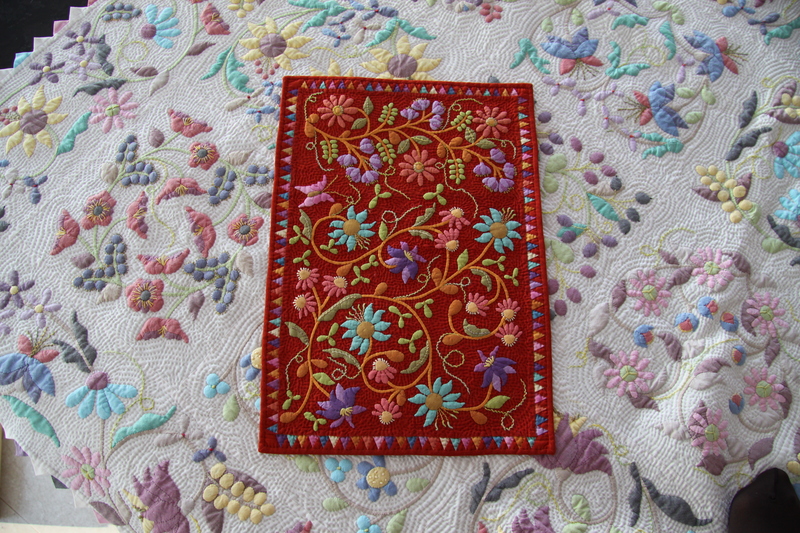 About 6 years ago I appliqued a quilt that was a whole new idea for me and when the last bit of binding was sewn down I put it on the floor and stood on a stool to look at it. The first, rather mad thought that came into my head was that I felt the world was better to have this quilt in it. That sounds so pompous and big headed and I don’t mean it in that way at all – it wasn’t even that great a piece – but all the same it’s lovely to fill the world with home made things that take time and love and give pleasure both in the making and subsequent enjoyment of them. and how her silk designs of the 1800s transpose themselves into my quilts. 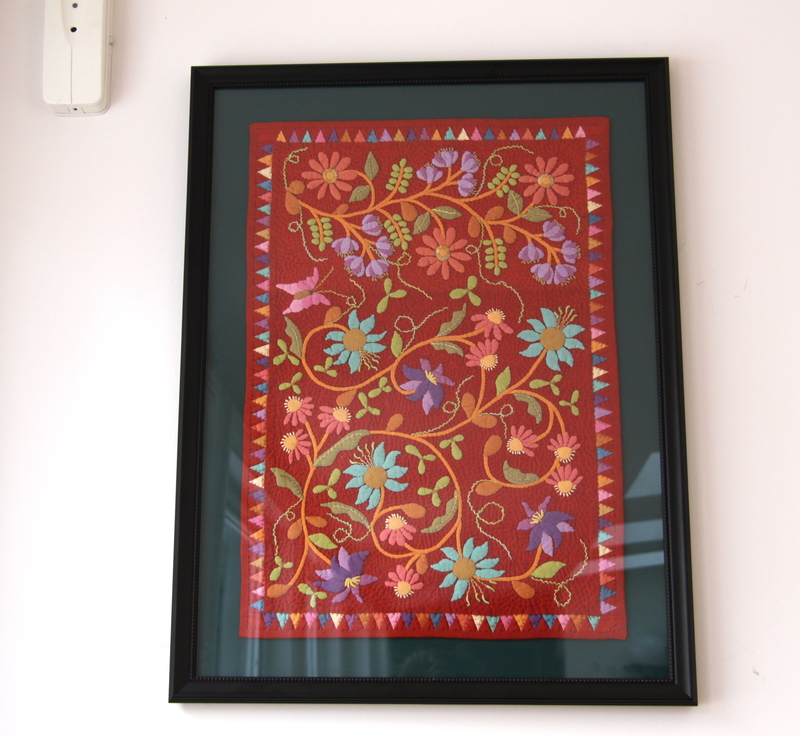 At first, when I wasn’t so confident in my own designs I copied some of her ideas to a degree that, for example, had she walked past my Trellis of Red Flowers Quilt she would have stopped and certainly recognised the connection between her little sketch and my quilt. But now just looking at her designs get me inspired with my own ideas and into the mood to design something new. (Type Anna Maria Garthwaite in your search bar and press Images – you’re in for a treat). I had a long conversation about design and musical influences last week with my son Max, a guitarist and musician. We debated copyright and the rights to your own creative ideas, whether it is right that one can ‘own’ an idea or not, especially given that one’s own ideas are usually inspired or influenced by others, what constitutes a breach of copyright in terms of a “riff” in his case or a design in mine. We decided how one never really owns the right to a design in the larger scheme of things, historically speaking and that artists just play a role in the furthering of design and ideas through the generations and just how exciting it is to be a part of it. I am lucky enough to have struck up a friendship with a fellow appliquer, Christine Wickert and we are full of mutual admiration for one another. She has just completed a quilt called “My Version of a Persian” which is so astonishly beautiful it takes my breath away. I think it is my favourite quilt of all time. Ever. I am lucky enough to have seen a photo of the completed quilt and its first viewing will be at Lancaster AQS. It is her trumpet to blow so I won’t tell you more but she has taken some designs of mine so much further, into a new realm of beauty and into a whole new dimension. A real thrill for me. I guarantee you will be seeing it in the quilt world this year 2014. I won’t jinx anything but if I were a judge it would win every prize in the book. Some kind lady got in touch with me last week to let me know about a Block of the Month quilt at the online store Common Threads which uses both of the designs from my Twilight Garden Pattern pack. Funnily enough I saw another quilt rather like this recently when both patterns from my pattern pack were used together. 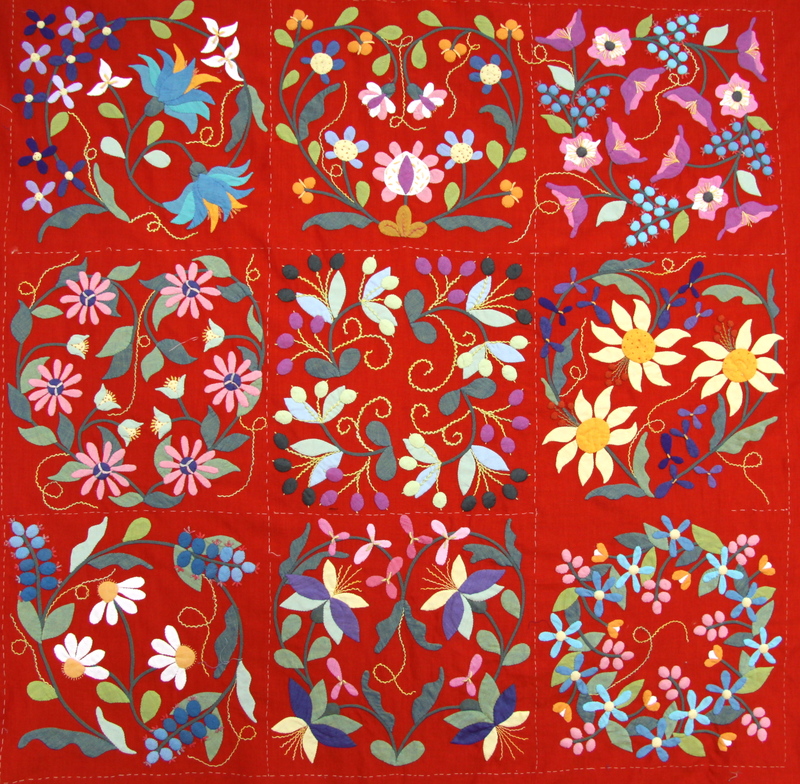 It took me aback at first sight because I had never thought of using the designs together in the same quilt – the Spring Flower Garden Quilt flowers are all almost botanically correct whereas those in Midnight Garden are mainly fantasy flowers out of my head. 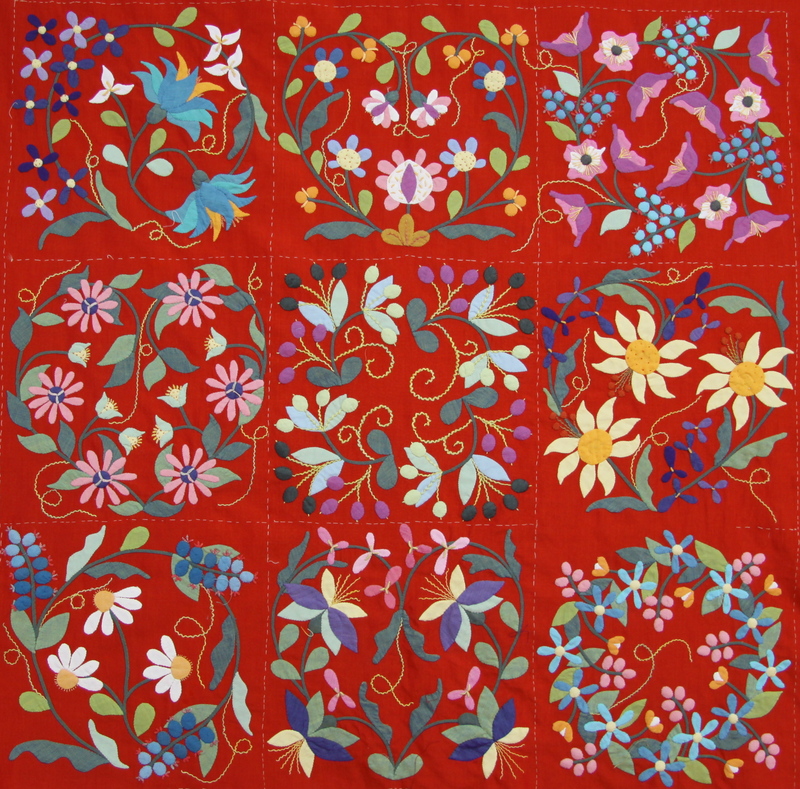 But it works and what a beautiful quilt this is – really gorgeous and perfect choice of fabrics. I love it and wish it were on my bed. Meanwhile I am so grateful to many of you for your help in my attempt to raise some money for the Melio Foundation here in Montreal. In order to write the pattern, draw it out and remember how I made it I have been sewing like a whirling dervish over the past couple of days to get a new version made. The full sized pattern is now drawn out and at the printers and so the pressure is off and I can just enjoy my sewing. What I love about this pattern is that because of the way it is constructed you can actually stop off at various points and the block still works. You can create four different versions using the one pattern. So if you’re not in the mood and don’t want to go the whole hog you can leave out the chillis and rosemary and still have a lovely block. 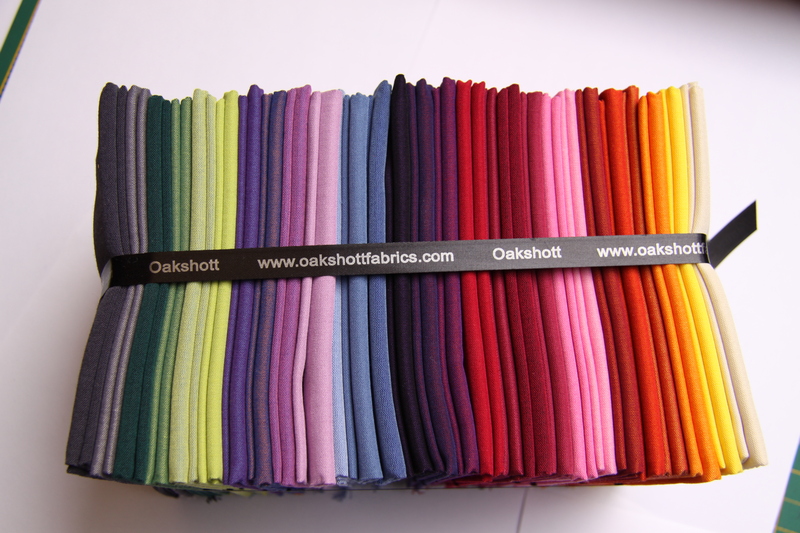 I decided to remake it in the cool elegance of the Oakshott Italy collection this week and felt that the colours cried out for a more modern restrained appearance. I decided to stop after completing the olives and not put in the chilli peppers or rosemary. I’m not sure what to do with it, whether to make a companion block out of the other six colours from Italy on the same background or whether to make this into another stool cover. So for the meantime I shall leave it as it is. Special Workshop Opportunity! Chilli Pepper, Rosemary and Olive Wreath. UNIQUE OPPORTUNITY!!! WHILE SPACES LAST! I will be hosting a day’s workshop and quilting in my historic house in Baie D’Urfe to the first twelve applicants to each workshop (one held at the weekend, one during the week). All proceeds raised from this workshop will go to Fondation Melio (www.fondation-melio.org) so not only will you have a fantastic day but know that your participation will go towards the purchase of a medical treadmill needed by Marie Enfant Rehabilitation Centre, the only rehabilitation centre in Quebec for under 18s and yet not in possession of this vital piece of equipment to help those children with brain and spinal injuries learn to walk again. For those who would like to know more, please see the video featuring our friend Manny, and his mother Sandra as they talk about why the centre needs this piece of equipment. Click on the website above, go to Videos and click on the third on the right to see Manny and why he needs to use a medical treadmill. For those of you anxious to have this design in your Deborah Kemball Library but who live too far away to attend the workshop this pattern and instructions is available to you for $20 plus postage and packing. Again all proceeds raised through the sale of this pattern will go to Fondation Melio. We will work on this design during the day – you will receive a full sized design, full instruction and demonstrations during the day for completion of this wreath. At 18” square it would be beautiful as a pillow or quilt centre. It is a new pattern and will only be available through this workshop. This is not a complicated design for applique and features my completely NEW embroidery stitch, seen here as rosemary and will be the first time I have demonstrated this stitch. Even if you have attended my workshops before I think you would benefit from this workshop as not only is there a completely new stitch and chilli peppers, but the leaves are rather different from my standard leaves and I shall be demonstrating this in silks and discuss at length the techniques used for silk applique. NB There are no sewn stems in this design! 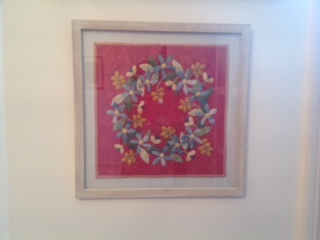 The day will also include a trunk show of my quilts and the chance to see many of them hanging throughout our house. 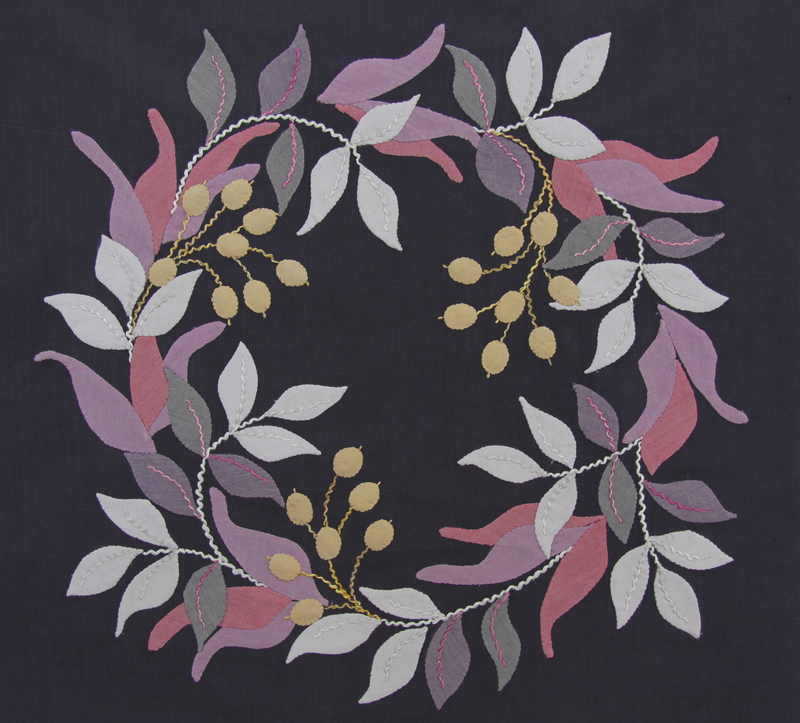 I will cover all aspects of quilting and applique both with silks and traditional quilting fabrics. Home made snacks and drinks will be provided and I think it will be the most fantastic day, lots of fun and a great way to while away a winter’s day. Please come and help me raise money for this important piece of equipment. The treadmill costs $450,000.00 so there’s work to be done! Dates: Sunday February 16th 10 am – 5 pm Monday February 17th 10 am – 5 pm Workshop Price $80 includes pattern, instructions, snacks and drinks. Easy parking too. I’ve finally finished the nine central blocks for my alternative brightly coloured (read multicoloured!) Floral Impressions. I can’t wait to see just how different a multicoloured version looks compared to the original pastel version. Here are two photos of my just finished applique – spot the difference! To find it, look at the first photo and see if you can see what is wrong with the colour balance. There really is an imbalance and the tiniest of changes has helped even things out a bit. If you can’t be bothered and don’t have a bored child within easy reach I’m sure someone will be quick to spot it. I think I might substitute one other flower along with this substitution later but I want to see some border flowers in place first before making the final adjustments. I rarely unpick my work – technical mistakes are covered up with embroidery or otherwise camouflaged but if a colour shouts too strongly and the balance of the piece is out of whack I will take my stitch ripper out for a rare appearance. Look what dropped through my letter box…..
My oldest friend, Sian, whom I have known for over 40 years, has more of my quilts and various handicrafts that anyone else and she has always used them so cleverly, more so than me, that visiting her is always one continual surprise to see pieces of work that look lovely, that I had forgotten, and what is more, I probably would have thrown out! She would be a sought after top interior designer in another life. Her talent in making the most beautiful homes astonishes me. And what she does with my bits and pieces astonishes me too. Before moving back to her house in London she and her husband lived in Wiltshire in the UK, in a gorgeous old rambling country house which she worked on for years and years culminating in the most beautiful home I know. Indeed it wasn’t just me who thought so, it was profiled in the magazine “Country Homes and Interiors” the year before she moved. I’m proud to say that nearly all her beds are covered with my quilts, the tables with my papier mache bowls and ornaments and the kitchen with my blue and white painted china. A little over a year ago I decided to send her a 12 inch pillow for her birthday. 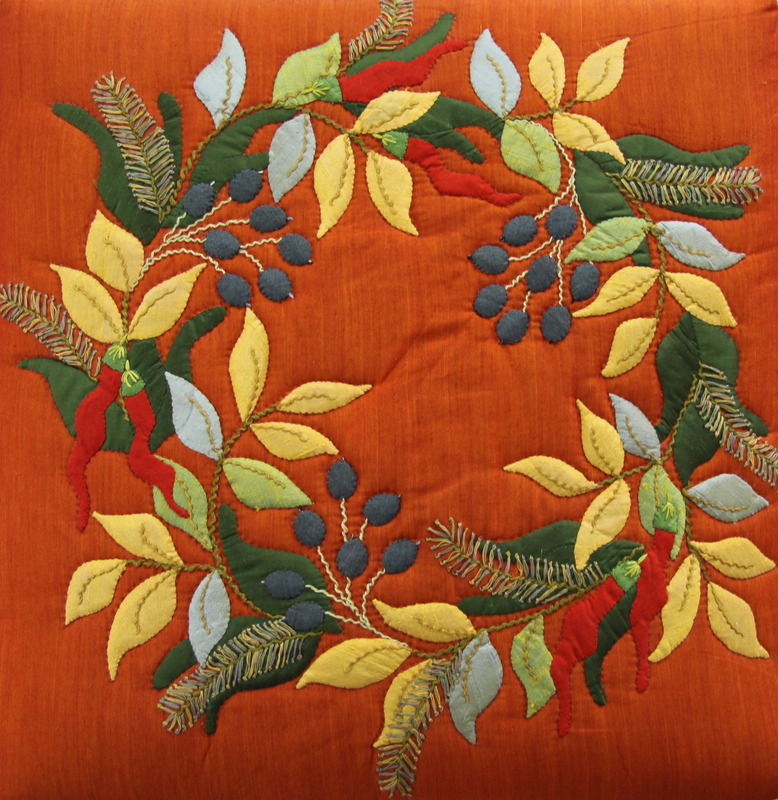 It was a sample I had sewn years ago, on my much loved Den Haan red background to try out a new design for a Berry Wreath. This design incidentally has never been used until my Floral Impressions Quilt and is next month’s block. I found it in a stash of fabric and decided to quilt it up for her, make it into a little pillow and make it truly hers by binding with red and white check (her favourite). I meant her to use it as a pillow, or suggested given its small size that it would be a great travelling bag for undies, or make up or something as it had a secure zip on the reverse. She told me she loved it but I didn’t know what she would use it for. When I went to see her in London there was my 12 “ piece beautifully framed and on her bedroom wall. She said it had been far too pretty not to frame and I was amazed how perfect it looked behind glass. Here’s a not very good photo (ipad) of the picture. It made me wonder if perhaps I should do the same with some of my pieces that sit around in drawers and believe me, I have many. I bit the bullet on my return from my UK trip and decided that my little Oakshott Miniature that I made for experimentation years ago (“How Small Can I Go?”!) was an ideal candidate as it languishes in drawers getting in the way – too good for a placemat and too small for a wall (and I’m not into dinky little ornaments and mats anyway). Here is it before and after framing. I’m pleased with the overall result although think perhaps the London version was was better as I like the way it looks as if it is floating on the wall with its pale background and mount compared to my stronger turquoise mount and black frame. 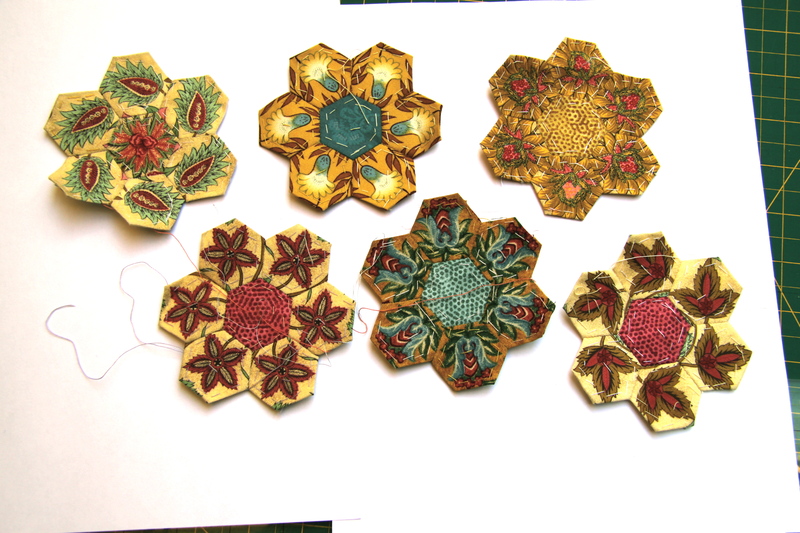 Whilst scrummaging around last week I found some hexagon pieces I worked years ago and thought how beautiful they were. I remember I gave a whole pile away in a mad moment (rather regretting that now) but knowing that I’ll never make a whole quilt like this wonder if they might look good framed too. I can’t believe the detail I went for – aren’t they lovely?